After a year (13 months) in Thailand being in Australia is kind of easy. Most of the time being in Melbourne and having lots of rainy/cloudy/sometimes hot and sunny days it almost feels like I am back home in the UK, especially now that I’m living with friends from home. So this is a bit of an intro into my life here and how easy it is to settle down on the other side of the world. Medicare card (for cheaper bills if you have to visit the doc) is easy, get the form online and fill it in, then take it to your nearest medicare family assistance office. There are a few about, then you receive the number there and then and the card a while later. I say a while, its been 2 months and mine hasn’t arrived yet. 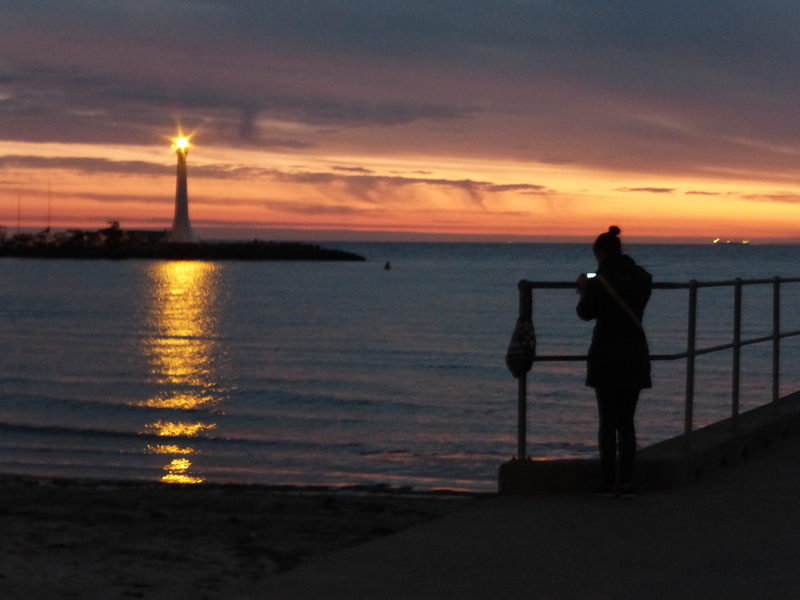 Banking – rock up to a bank and sign up. We chose Commonwealth as they are everywhere! But other popular ones are TAB or Westpac. Pretty sure they’ve now got a way to set it all up before you even get out here. You can register the address to the hostel you’re in and your UK phone number and change them when you’re sorted. Phone – I went through a company called Global Gossip. Since we signed up as 3 friends together we have free texts and calls to each other ALL THE TIME. Pretty fab because they’re the people i talk to most. It’s also great for calling house lines at home. I spoke to my parents for half an hour and it cost less than $5. I’ve only used $30 of credit since I’ve been here. 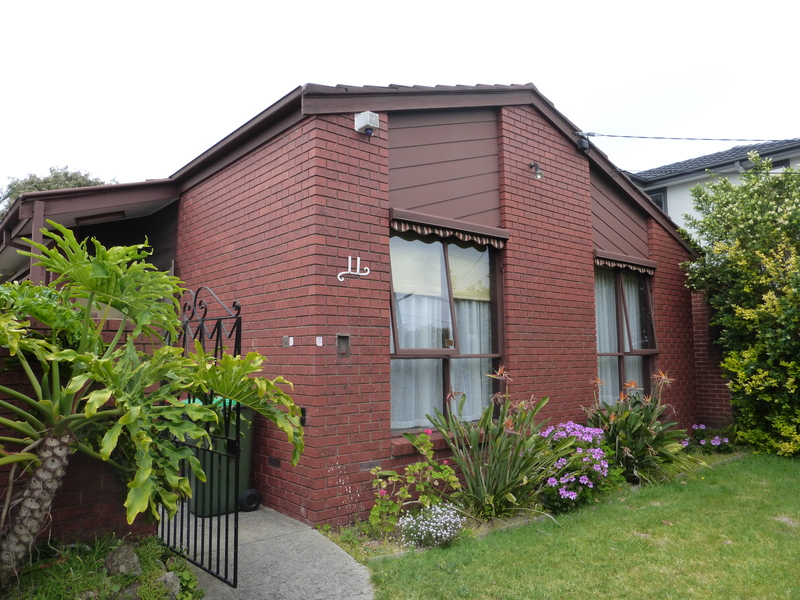 Housing – Some people say stay away from Gumtree.com.au but nearly every foreigner i know who lives in a share house here found it through gumtree. We tried the proper route of signing up to agencies to properly rent a house but hardly any here are furnished and they were miles away form CBD. Plus we wanted to live with more than just the 3 of us. In the end we used http://www.housesharemelbourne.com.au. In theory the idea is great. (I say in theory, for a month we only had 2 forks for 11 of us. And sometimes the landlords take a while to deal with problems) All their properties are close to public transport, and near supermarkets and are all pretty newly made (so new that when we moved in my friend still didn’t have walls to her room for first 2 days.) Plus you can sign the contract for as little/long as you like but you pay different prices for different rooms and length of stay. We are in Caulfield South, 25 mins on train from the centre and there are 11 of us living here, the place is pretty big. I pay $250 a week everything included for a double room, desk, cupboard, bedisde table, bedlinen etc with tv. Singles here are $200 a week, all the same as above but no tv, based on 6 months contract. Yeah its expensive but its simple. Our house is international, living with Italians, Swedish, SriLankans and Brits, its a good mix! Sometimes it reminds me of being at uni except people are more grown up (sometimes) and we go to work instead. 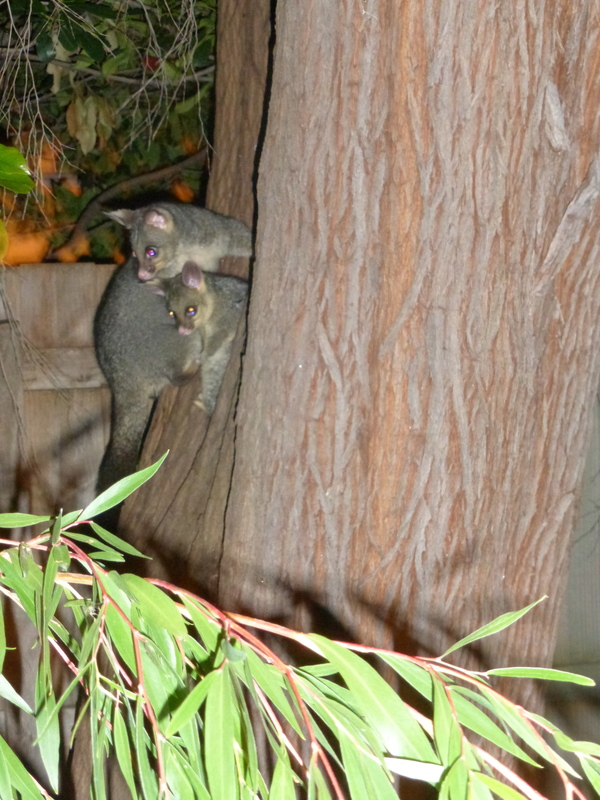 Our house came with free Possums in the back yard! 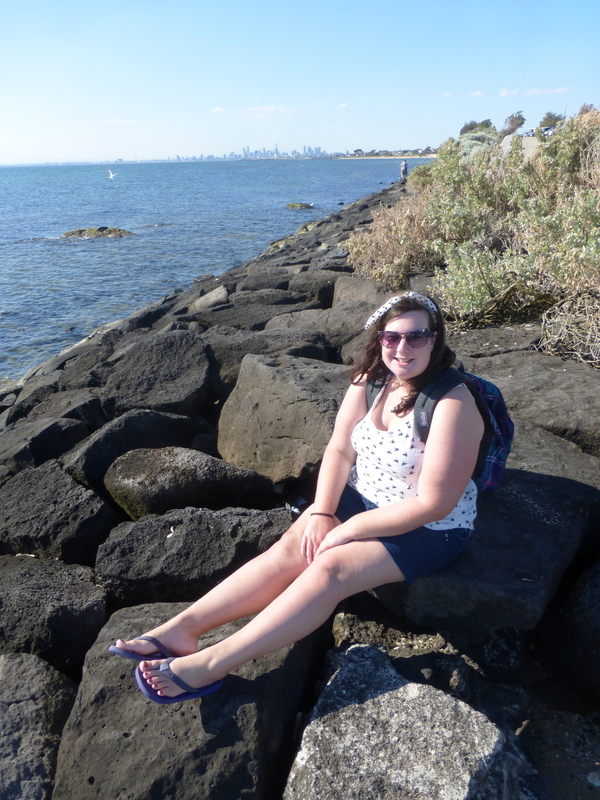 Exploring Melbourne! There is so much to see and do. 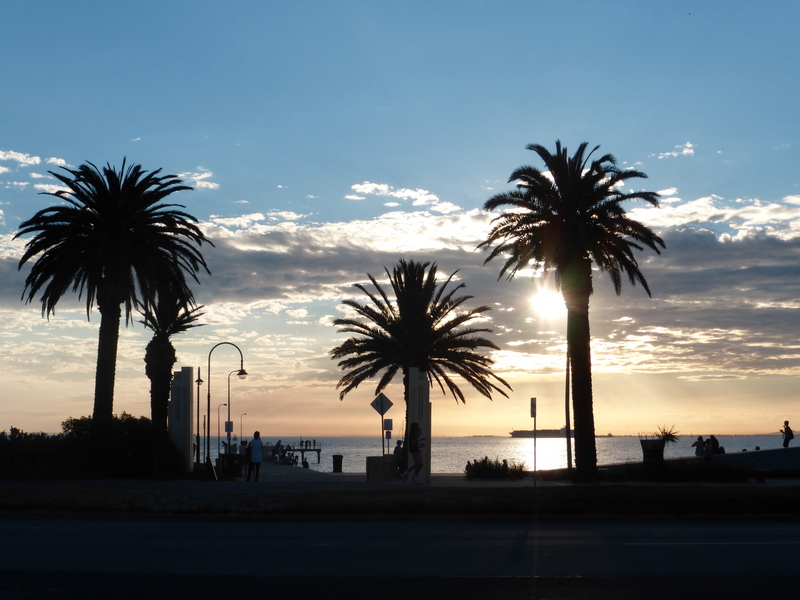 Our hostel was located in St. Kilda and I am so glad we chose this spot! 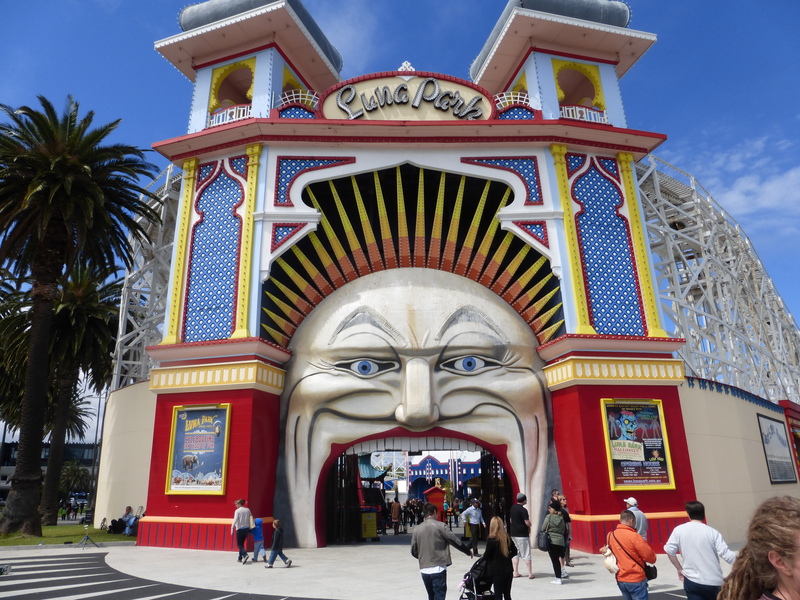 It’s stunning and has something for everyone.. a beach, shops, lots of bars, froyos (every other shop sells diff flavoured frozen yoghurt) and cafes, famous cake shops, iconic Luna park, Palais Theatre and little penguins at the end of the pier each sunset. 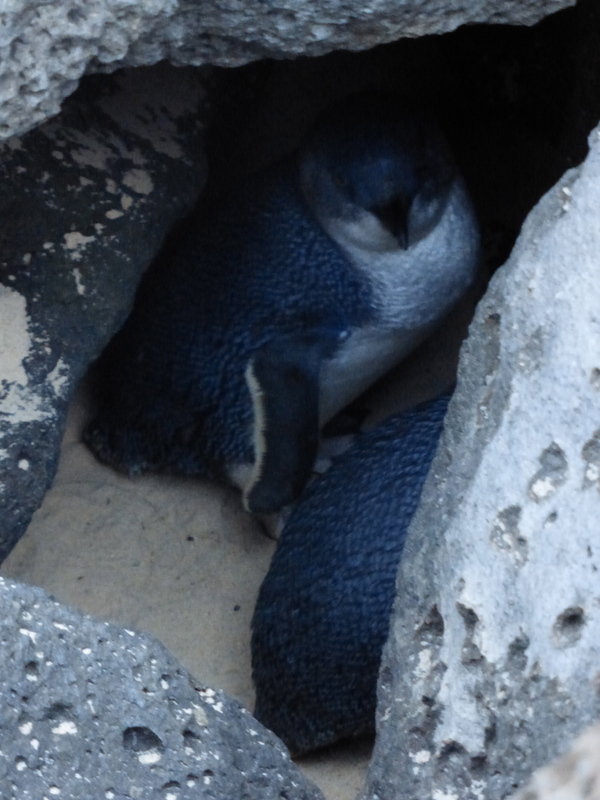 A little penguin (also called Fairy or Blue penguins) found at the end of the pier..
Other free/cheap things we have done are wandering around Melbourne city and seeing Federation Square. 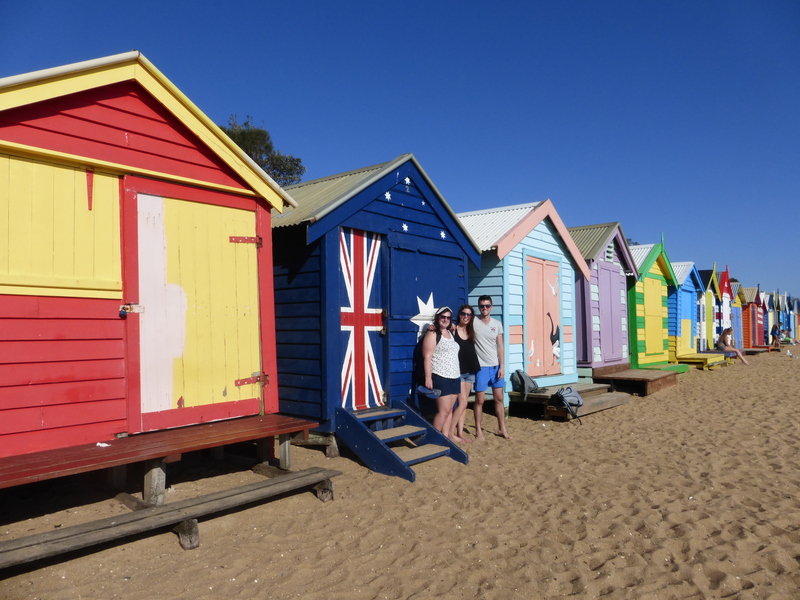 If you are a student the Melbourne Museum has some really great exhibits for free (£10 if not a student) We also went to the docklands to see some random statues and did a train trip to Brighton beach where the brightly painted beach huts are. My Christmas party with work was at the ACMI, the Australian Centre of Moving Image which has some fabulous exhibits to do with films and music videos (silent disco thing) which because of the party being there i got to see for free! 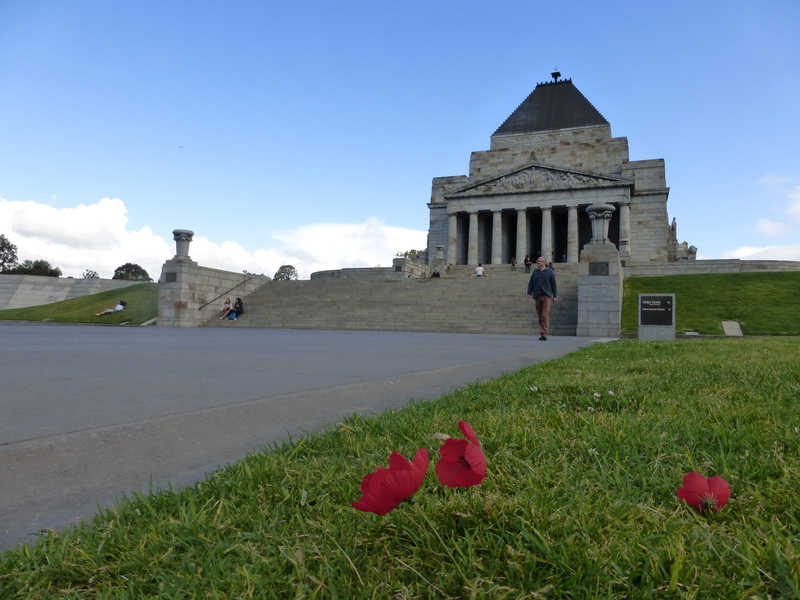 Close to the centre is the Shrine of Remembrance, which is a nice building commemorating those who served in the wars. If you climb the stairs to the top there is a view over the city and the Kings Domain park and it looks really pretty. 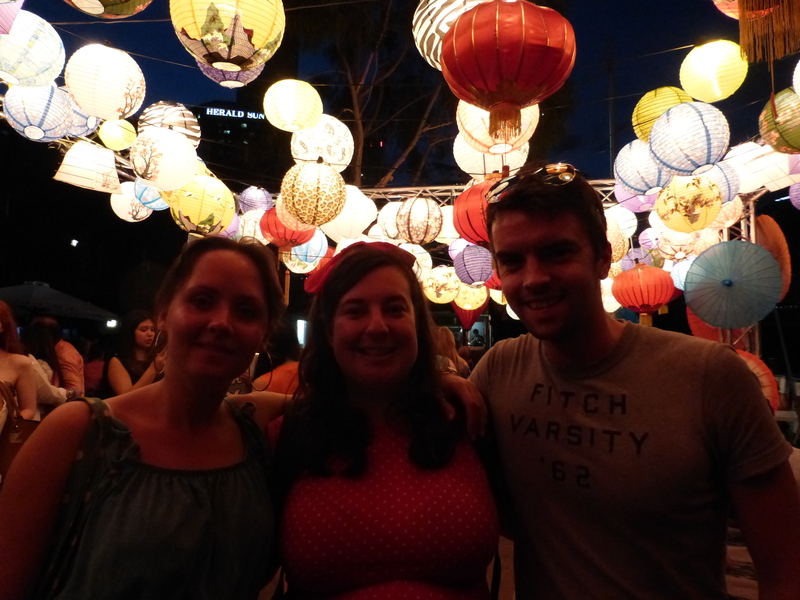 In November another event we went to was the Night Noodle Markets in Alexandra Gardens for Goodfood month. For 2 weeks they had stalls selling lots of yummy Asian food. Everyone sat on picnic rugs in the gardens and listened to the music and ate good food. 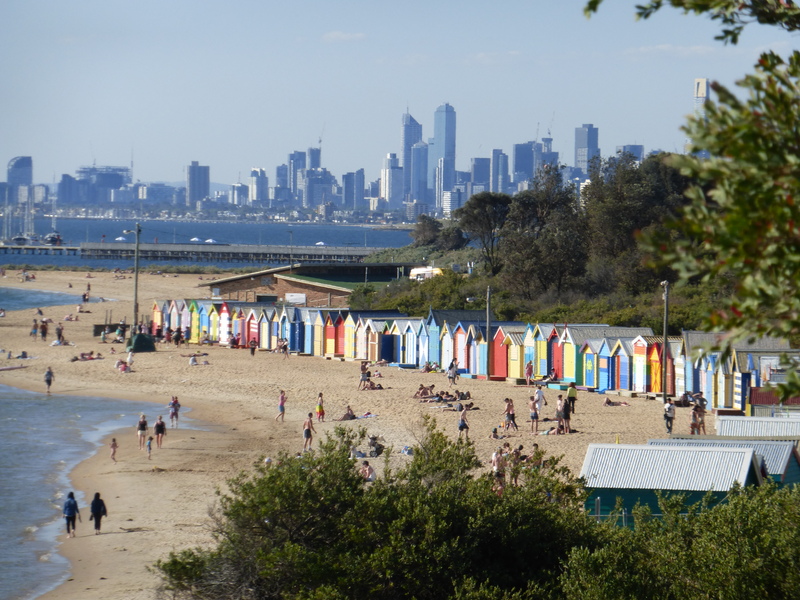 Coming soon… Trips away from Melbourne!